Radical acceptance is a transformative skill we teach in our San Francisco Dialectical Behavior Therapy (DBT) skills group. Therapy is usually focused on change. And of course, you will work on change in therapy. But sometimes there are things in life we can’t change, or can’t immediately change. Sometimes we need to accept what feels unacceptable to lessen our suffering and figure out how to move forward. 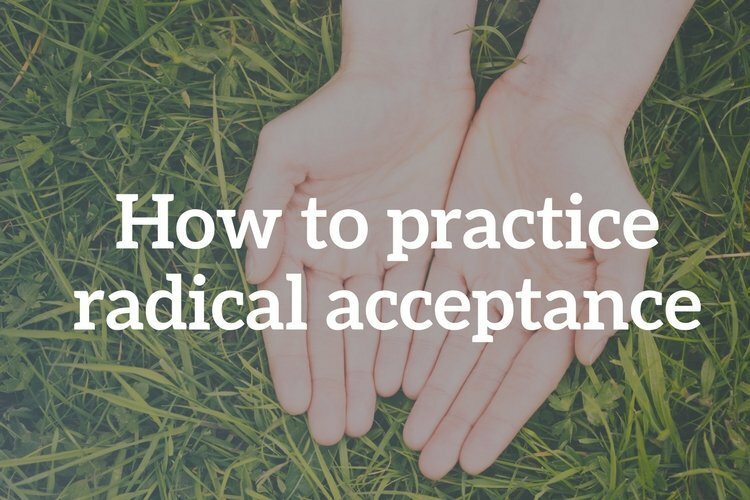 Part 1 of this series on radical acceptance explores the concept of radical acceptance. This post explores how to radically accept. Because understanding the concept is one thing, doing it is another. The first step towards radical acceptance is awareness that you are resisting reality. Sometimes this is obvious, but other times it’s subtler. Once you’ve recognized that you are resisting some truth in your life, the next step is to turn your mind toward acceptance. ‘Turning the mind’ is a DBT skill that supports radical acceptance by helping you turn away from resisting reality and turn towards acceptance. You don’t have to go from resistance to acceptance – often that’s too big a leap. But you can make an internal commitment to stop fighting what is. Turning the mind is about choosing to radically accept, which is often the precursor to acceptance. It is becoming willing to accept. When you are fighting reality, your body may be tense. It’s not uncommon to tense the muscles of the shoulders, face or stomach when you’re resisting something. Tight muscles work against relaxing into acceptance. The first one is called Willing Hands. While sitting, relax all the muscles in your arms and then turn your palms facing upwards, resting them on your lap. Notice if that shifts anything in your body. The second one is called Half-smile. Making sure your face muscles are relaxed, turn the corner of your mouth up slightly. Notice how that feels and if that moves you towards acceptance. Even if you’re not able to radically accept, try acting as if. If you did radically accept, what would you do differently? How might you feel? When you practice radical acceptance, it does not mean that you stop working on things you want to change. It’s not about passivity. But the only way to work effectively towards change is by fully and completely accepting what is. Practicing radical acceptance does not equal approval, forgiveness or even compassion. Usually, radical acceptance is not one-and-done. Radically accepting that it’s raining outside when you planned to go on a hike isn’t too challenging. You can probably accept it, feel disappointed and move on. If you’re working on radical acceptance of something very painful, though, you will probably have to radically accept over and over. If you lost someone you love, or are dealing with a chronic illness, it’s normal to go in and out of acceptance. Each time you notice that you’re fighting reality, remind yourself you’re not doing anything wrong and gently shift your focus towards full acceptance. Let whatever emotions arise move through you. This is the path to freedom and peace. Wondering how practicing radical acceptance can help you?